Here's a few WIWs from the last few days. Nothing very special. #1 - sorry for the dark pic. It's a burgundy brocade sweatshirt with black skinny jeans and tall eyelet boots. I added a nice black cuff that was a Christmas gift. (better pic in #5) It's 3D printed plastic (so the geek factor is high, which makes it very cool to me). #2 is an attempted copycat from Beth at Seersucker and saddles (inspiration pic #4). I wish I'd worn higher contrast shoes. #3 is a semi-white-out formula. A new-to-me white tee with a few sequins that I'm not sure whether it'll earn it's keep, white jeans and a blue jean jacket, because I felt like wearing white with navy today. I love 1 -- wow, that is lovely. I like your denim and white look too! What Ceit said (thanks for being my brain Ceit!). The first one is perfect for sure! Close up of cuff, please? What a cool bracelet! So much better than, say, a 3-D printed gun (can't believe they can do that). Your "nothing very special" is really fabulous casual outfits for adding "style" to your real life. 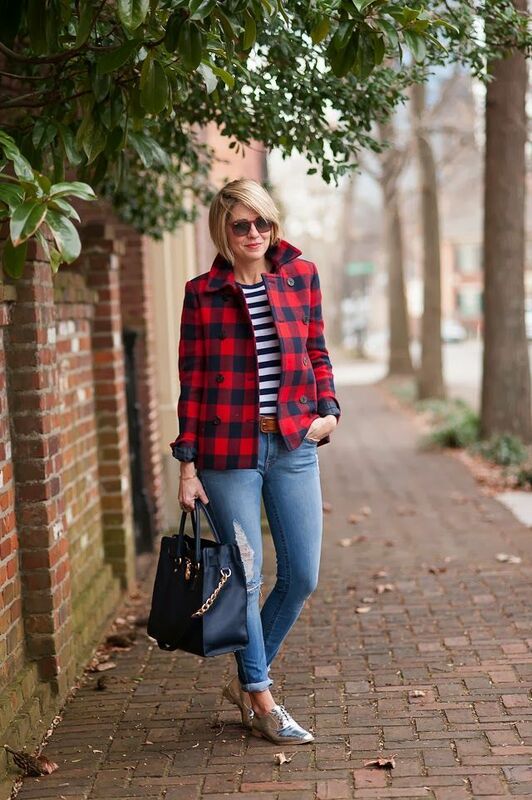 It's far easier to dress with a big budget for a blog photo everyday. I'm impressed with your accomplishments! I love #1 -- It's hard to tell in this pic, but I know berry shades to be very flattering to you. The silhouette is simple, but with a modern flair. I think this look is a great one for you, and very practical for keeping warm, but not too warm, indoors. I'd try a partial zip of the vest in #2, or a stronger, visible belt. I think the white top in #3 is earning its keep here, and I love the easy, relaxed column of white, with no touch of "medical uniform" or "fussy junior leager." You've got a great base here. The jean jacket seems just a tad bulky in this photo, but it could be just the angle of the picture, and the jacket might look different IRL. I do think that what Angie calls a "cheeky denim jacket" is slimmer in the body and arms. You might keep an eye out for one with more shaping if it's in your budget. Old Navy does a good job with denim jackets. I have one that's almost too tight in the arm, but is shaped for a woman. Now, I'm going to get dressed myself .... for the gym. And I've been in loungewear for the last 24 hours. I'm afraid I'll forget how to wear real clothes! Here's some close-ups of just the cuff. My brother-in-law printed it. He has his own printer, and no job (he graduated last May with a Mechanical Engineering degree, and there seems to be no jobs around here for entry-level MEs). So he printed all of his Christmas gifts. I feel lucky that he drew my name, because this is an incredibly cool gift. Oh wow! What a great gift. Did he design it too? 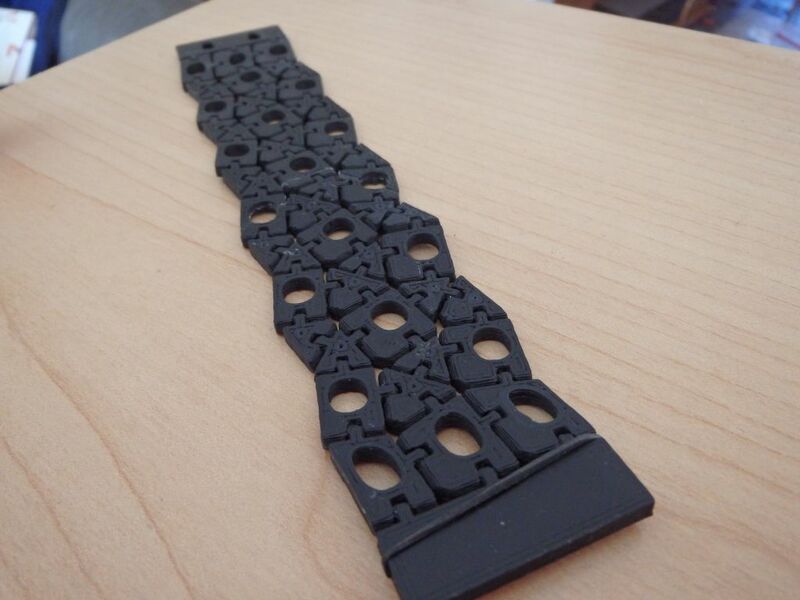 Did he print each piece out and then assemble it into the bracelet? 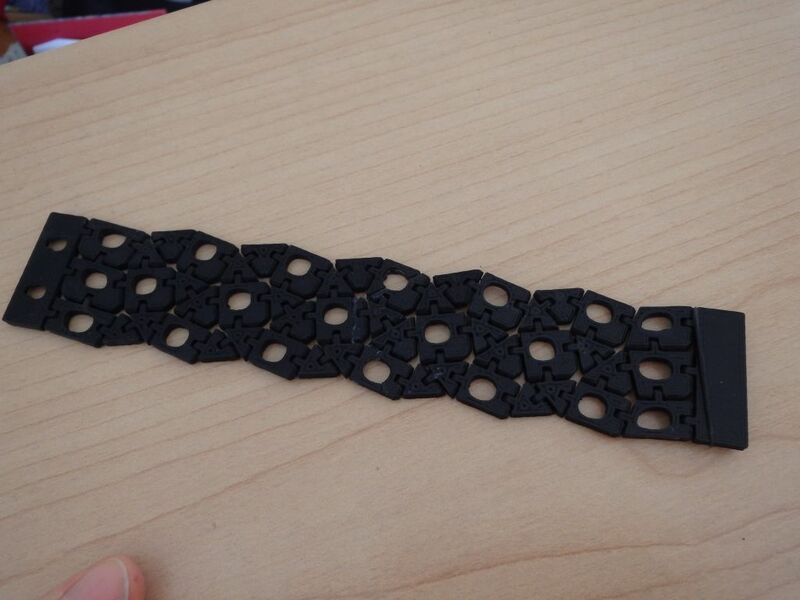 It's printed all in one piece, with ball style links that easily "broke" making the bracelet flexible. The clasp doesn't hold as well as I'd like - so I added a little rubber band, that keeps it on nicely. I may eventually replace the clasp with strong velcro. I really love #1 and #3. 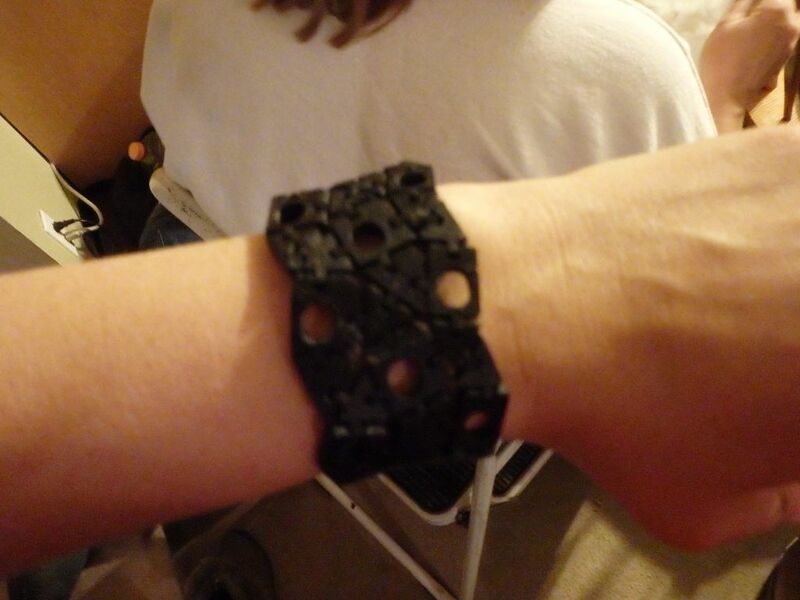 And the 3D-printed bracelet is awesome! 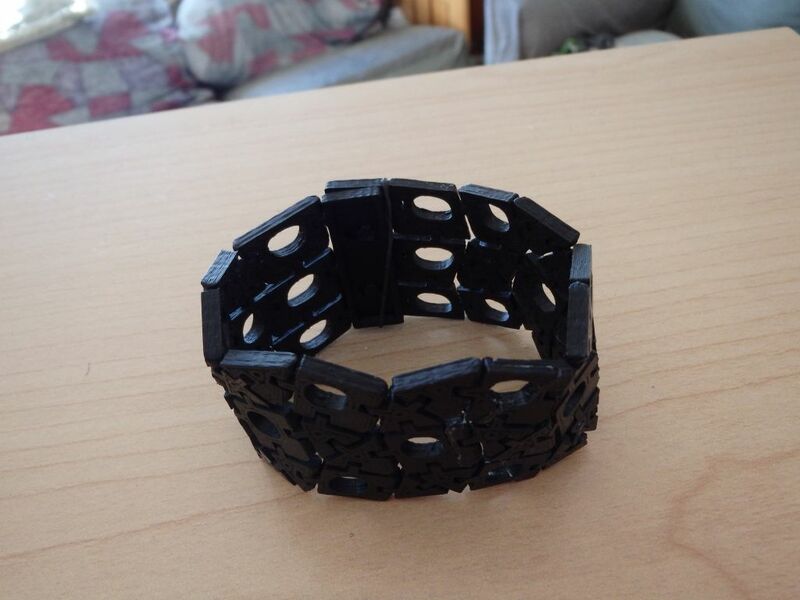 Okay, the 3D printed bracelet is SO COOL!!! Geek factor for the win! I really like #1. It is perfect in my book. Comfortable, attractive, and warm. I have a poison eye for plaid, really poison, so it is hard for me to comment objectively. I always like you in winter white out, so of course I like #3! I like #1 although it's a little hard for me to see (using my imagination for the colors). I also really like the winter white outfit. I like the plaid and stripes together but agree with others that the vest is a little too bulky. I like #2. That's truly Lumber Jack Chic. Well done, Amy.